I think we've overlooked so much of our violent past because, frankly, we didn't really want to know about it. It probably didn't help matters that these megalithic sites were named portal chambers and tombs. Portal tombs establishes a mind set that leans to fulfill that title, for those familiar with Dr. Wiseman's book Quirkology. The fact that an archeologist from the last mellinium called them "portal tombs" has influenced our interpretations of them ever since. Their alignments to each other and elements of the sites that often marked solstices were explained as cult related activity. We were just surprised that these ancient peoples knew how to tell time at all. Dead bodies found interred around the sites were chalked off as sacrifices. Even the famous Bog People found nearby, were explained as ritual sacrifices though evidence shows extremely violent ends. Every generation is born at a space/time juncture and all of it's opinions are based on what it knows. Jericho's natural resources, beauty, and natural defenses caused her to become the ideal locale for trade. These attributes also made her the source of envy and a coveted possession for invaders of ancient Palestine. Given that Jericho is located in roughly central Palestine, access to her neighboring city-states was a major key to Jericho's importance to invaders and to traders alike. Jericho's location was ideal for the establishing of trade routes and for communication exchange. Jericho had relatively easy access to southern neighbors such as Jerusalem and Bethlehem, and to northern neighbors such as Beth Shan and Nazareth. On the other hand, the mountains on her eastern and on her western sides which fostered natural defenses by raising over one mile in height, also caused isolation from her neighbors. For these reasons, invaders saw Jericho as a key to controlling Palestine. and cowrie shells from the Red Sea." Skeletal collections with trauma found from the Neolithic period in Anatolia suggest that injury was caused by daily activities and lifestyle, rather than systematic violence. However, shortly after this period there is an increase in trauma associated with violence that may suggest an increase in stress within and between populations in this area. In order to examine this conclusion, a new article by Erdal (2012) looked at the skeletal remains of a potential massacre site from the Early Bronze Age in Turkey.The human remains come from the site of Titriş Höyük, dating to 2900-2100 BCE. The site grew very quickly in this period from a small farming community to an urban centre within a large mud-brick fortification wall built over a stone foundation. Within one of the house structures (House #2, Room 13), a burial was found in a plaster basin beneath the floors. 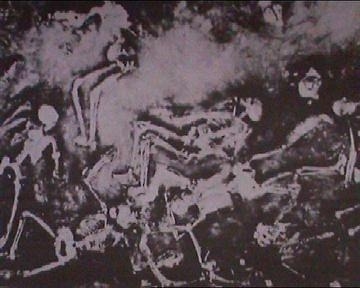 While the location of the burial and the basin are not unique, the state of the individuals is.The presence of such a high number of perimortem wounds, all in the same area and occurring on the majority of individuals in a single mass grave all point to the conclusion that their deaths, or at least injuries, were not accidental. Combining this with the evidence of fortifications around the city suggests that these individuals were killed by intruders rather than interpersonal violence. Comparing the two types of injury clusters with weapons from this period leads to the conclusion that they were caused by battle axes in the case of the larger injuries, and dagger or spears for the smaller ones.Erdal (2012) argues that “the frequency of perimortem trauma increases during periods of environmental deterioration, population growth, political breakdown and competition over resources while sub-lethal cranial trauma are observable during all periods”. Since Anatolia was undergoing a period of environmental, as well as cultural change, it is likely that violence was one of the consequences. Here are some recent archaeological finds that support the idea that megalithic sites were an extension of one of the human conditions. 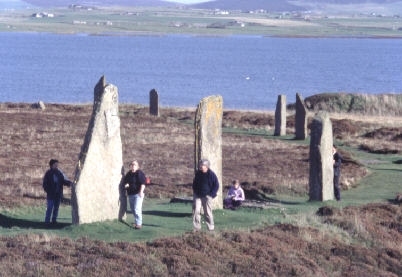 New archaeological dig at Neolithic Orkney site indicates mass graves with up to 40% of the interred showing evidence of violent ends. 80 burial sites have been located. "The last levels of occupation show skeletons with sword-cuts (12), holding hands and lying in the streets as though recording a tragic end to the city"
This site is in Germany and dates to around 4,600 years ago. "The whole site paints a macabre scene, a number of bodies have been uncovered, most showing signs of violent death and defensive wounds such as broken wrists and fingers as they tried to protect themselves from blows. The majority of the bodies in the graves were children or women, and only one of the skeletons belonged to a man in his prime, aged between 25 and 40. It is likely that these people were murdered in a raid by a rival tribe, out to steal young women, before the survivors returned to bury their dead." 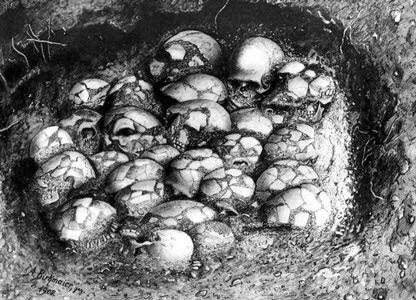 Evidence of mass cannibalism in which even children and unborn babies were on the menu has been uncovered in Germany by archaeologists. Analysis of 7,000-year-old bones dug up at Herxheim in south-west Germany suggest the region was a centre for cannibalism Professor Chris Scarre, a neolithic expert at the University of Durham, said after learning of the study that the Herxheim site could represent useful evidence of a society in turmoil ...But with almost 500 other bodies already dug up at Herxheim and at least as many again still to be recovered the final number of people eaten by cannibals could be much higher....Herxheim’s remains date from a period when Europe is thought to have been plunged into upheaval, violence and decline following 500 years in which Neolithic farmers first settled the region. Aside from the archaeological data to support wide spread violence in prehistoric times we also have art made by the peoples who lived then. Here is an image from Val Comunica in northern Italy. Why then was a hunter-gatherer culture so prone to violence? "With the sites from these periods archaeologists begin to see the signs of "true" cultures emerging. The Qadan (13,000 - 9,000 BC) sites, stretching from the Second Cataract of the Nile to Tushka (about 250 km upriver from Aswan)..... Yet even this would put the Paleolithic Egyptians on almost the same technological level as the early Neolithic peoples in Europe. Oddly though, almost as soon as this protoagriculture was developed, it appears to have been abandoned. Beginning around 10,500 BP, the stone sickles that were so predominant seem to simply fade out of the picture and there is a return to the hunter-gatherer-fisher culture that came before. It was about this time that the demise of the various Paleolithic peoples in Egypt began. 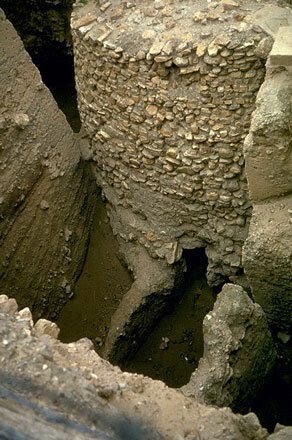 It may very well be that the abandonment of protoagriculture contributed to this, but the discovery of the Jebel Sahaba cemetery sheds some new light on the end of many Paleolithic cultures. In all, three Qadan cemeteries are known: one at Tushka, and two at Jebel Sahaba, one on each side of the river. Although many of the remains unearthed at these sites are the usual cross-section of elderly and young, chieftains and commoners, there are quite a disturbing number of bodies from the final 5,000 years of the Upper Paleolithic that appear to have died by violence. Stone points found with the remains were almost all located in areas of the body that suggests penetration as spear points or similar weapons. Most were located in the chest and back area, with others in the lower abdomen, and even a few entering the skull through the lower jaw or neck area! Additionally, the lack of bony calluses as a result of healing near these points shows that in many of these cases the wound was fatal (bone tissue repairs itself rather quickly, preliminary healing often begins before even that of soft tissues). A statistical analysis of the main cemetery at Jebel Sahaba gives a figure of 40 percent of the people buried there died from wounds due to thrown projectiles; spears, darts, and arrows. Why then was a hunter-gatherer culture so prone to violence? One explanation is diminishing resources, caused by the growing aridity and the failure of the protoagriculture experiments. The Jebel Sahaba cemeteries must only have been used for a few generations and for that many violent deaths to occur within that time supports an explanation based on massive intertribal warfare. Also, since the victims were of all ages (except infants; only one infant is buried in each of the Jebel Sahaba cemeteries), this could indicate that the majority of the skirmishes were actually based on raiding and ambush, as "normal" warfare usually only involves young to middle-aged males. And we should not dismiss the possibility of invasion by a more advanced, or at least more powerful, people from outside, especially if Jebel Sahaba and similar sites date to as late as 7000 BC, as by then the people would have been in competition with larger and more advanced Epipaleolithic cultures. Our concept of the peaceful hunter gathering neolithic period may be misguided. The following is an excerpt from a paper published by the Department of Archaeology, Cambridge University. "Skeletal remains portray long-term changes in violence. Skeletal trauma appears highest in the Neolithic, uncommon in the Copper Age, and moderate to high in the Bronze and Iron Ages -- a pattern which contradicts the image of the peaceful Neolithic and the warlike Copper Age derived from art and artifacts, and which complex changes in the social use of violence. " Bitumen is mentioned in the bible in the context of war. Bitumen from the Dead Sea may well be among the most intriguing of the many trade items that passed through Nabataean hands. Bitumen or tar had been gathered and sold to the Egyptians for many centuries by those who lived on the shores of the Dead Sea. Over time, the Nabataeans gained a monopoly on this product and consequently they came to the attention of the military powers in Damascus. Some of the earliest historical mention of Dead Sea bitumen is found in Genesis 14 where the scriptures tell us of battles fought in the area of the bitumen pits. The time setting for this event would have been during the life of Abraham, who is generally considered to have lived around 1750 BC. 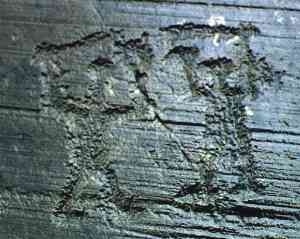 This is the first literary evidence of bitumen in this area. The Egyptians used bitumen in the embalming process as well as for waterproofing coffins and other articles. Another common practice was to use bitumen as a cement or binding agent. In addition, this substance was employed in the manufacture of imitation gems and in the coloring and production of metals. The Dead Sea, known in antiquity as Lacus Asphaltites (Asphalt Lake), produced the bitumen, which the local inhabitants harvested to sell to Egypt. The Dead Sea was relatively close to the Nabataean center at Selah. As Nabataean power grew, they managed to gain control of this industry. "Warfare, triggered by political conflict between the fifth century B.C. 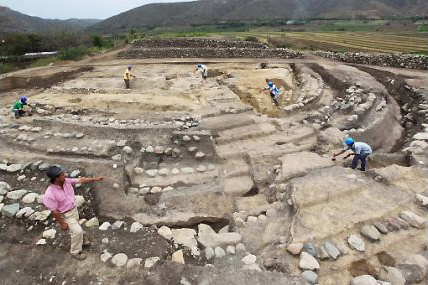 and the first century A.D., likely shaped the development of the first settlement that would classify as a civilization in the Titicaca basin of southern Peru, a new UCLA study suggests." This happened to be found nearby, proof of at some point a thriving community. Perhaps these sites served as weigh stations and processing centers or housing for miners, porters and their families. Here is account of violence during recorded historical times. I think the battle described below may have not been the first of its kind. "In his work The Histories, the second-century B.C. Greek historian Polybius chronicles the rise of the Romans as they battled for control of the Mediterranean. The central struggle pits the Romans against their archenemies the Carthaginians, a trading superpower based in North Africa. For 23 years, beginning in 264 B.C., the two rivals fought what became known as the First Punic War. As Polybius tells it, the war came to a head in 242 B.C., with both powers exhausted and nearly broke after two decades of fighting. The Carthaginian general Hamilcar Barca—the father of a later adversary of Rome, Hannibal—was pinned down on a mountaintop above the city of Drepana, now the Sicilian town of Trapani. As the Carthaginians assembled a relief force, the Romans scraped together the money for a fleet to cut them off. According to Polybius, in March 241 B.C., the two sides met in between the Egadi Islands, a trio of rocky outcrops a few miles off the coast of Sicily. The clash brought hundreds of ships and thousands of men together in a battle that helped shape the course of history. A string of discoveries just a few miles off the coast of western Sicily are now supplying new evidence of that war and the battle that brought it to a close. Working from a well-equipped research vessel, a team from the United States and Italy has located what can only be artifacts from what is now known as the Battle of the Egadi Islands. It’s the first time archaeologists have gone looking for and successfully uncovered evidence of a particular ancient naval battle. While ancient accounts often exaggerate the numbers of men or weapons involved in a battle, or are vague about their exact locations, Polybius turns out to have been fairly reliable. His basic report about the Battle of the Egadi Islands has been confirmed. “Ships met in a battle, and ships sank,” says Jeff Royal, the director of the Florida-based nonprofit RPM Nautical Foundation, which is leading the work."